I have just published the second timeline of July, and now I can finally post the statistics for the same month. Let’s start saying that this month was surprisingly rich in terms of events (I collected 130 records vs. 96 in June), maybe the crooks wanted to complete their home works before going to vacation. As usual, let’s start with the Daily Trend of Attacks chart, which shows a trend clearly increasing in the second half of the month where the majority of events is concentrated (80 vs. 50), with a peak on the 20th. 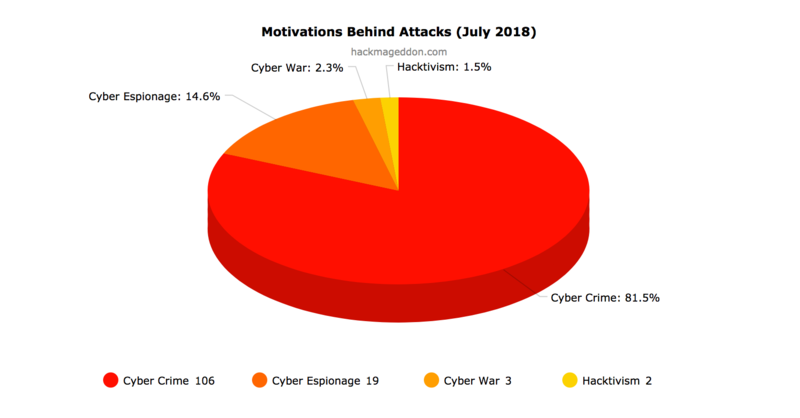 Cyber Crime leads the Motivations Behind Attacks, with 81.5%, a slight decrease compared with 84.4% reported in June, once again ahead of Cyber Espionage with 14.6% (it was 12.5% in June), Cyber Warfare (2.3% vs. 2.1%), and Hacktivism (1.5% vs. 1%). Malware is stable on top of the Attack Vectors chart with 29.2% (it was 27.1% in June), ahead of Account Hijackings (18.5% vs. 16.7% in June), and targeted attacks (14/6% vs. 13.5% in June). Interestingly unknown attack vectors only rank at number four this month. Single Individuals rank on top of the Distribution of Targets chart with 20% (a percentage very close to June when it was20.8%. The healthcare sector is under attack and jumps at number two with 16.2%, stealing the position to Multiple Industries sliding at number three with 13.8% (it was 15.6% in June). In any case, if you want to have an idea of how fragile our data are inside the cyberspace, have a look at the timelines of the main Cyber Attacks in 2011, 2012, 2013, 2014, 2015, 2016, and 2017 (regularly updated). You may also want to have a look at the Cyber Attack Statistics, and of course follow @paulsparrows on Twitter for the latest updates, and feel free to submit remarkable incidents that in your opinion deserve to be included in the timelines (and charts).